In commodo accumsan vulputate. Integer et lectus ac risus commodo convallis vel ac nulla. 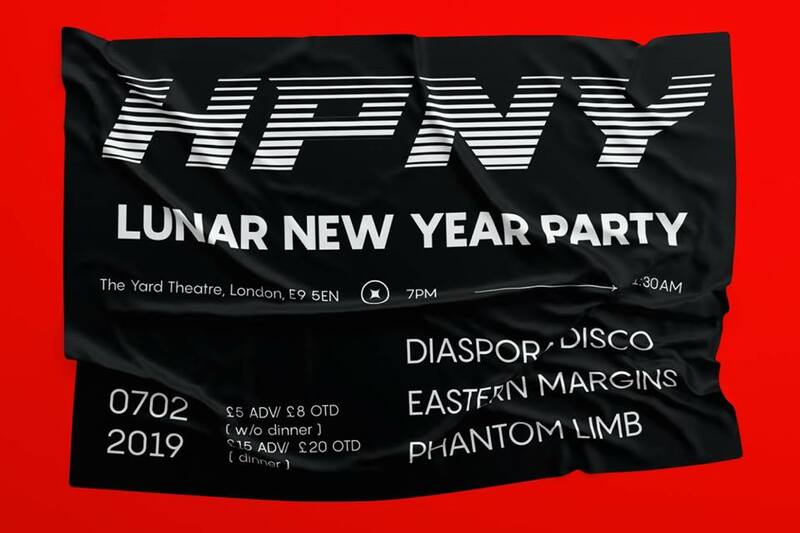 Diaspora Disco, Phantom Limb (Katie Yook & Kathy Cho) and Eastern Margins – three diasporic Asian nightlife and art collectives – are coming together for the first time at The Yard for a Lunar New Year performance club night as part of NOW 19. The night begins with a reunion dinner by Berlin-based artist & chef Julez Noh, who will be flying in exclusively for our party to cook an incredible feast. We have a limited number of dinner tickets (includes entry to party) available so get them early! After dinner we’ve got performances by Eunjung Kim, Lucky Ping-Pong Dragon Karaoke, Monica Tolia & Rachel Cheung with installations going all-night by Jia Qi Quek and Soljee Ahn! Finally, we end the night with music by multimedia artist Jae Ho Hwang, who will be performing a DJ set. Originally from South Korea, Jae Ho produces electronic music influenced equally by the club and his Korean heritage. Expect everything and nothing: from old Korean Music to Experimental to Avant-Garde to Electronic to Techno to Pop.